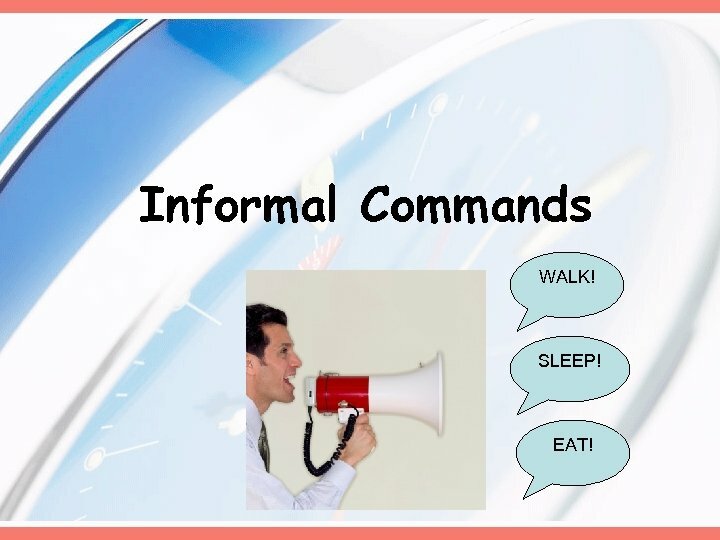 Informal Commands WALK! SLEEP! EAT! 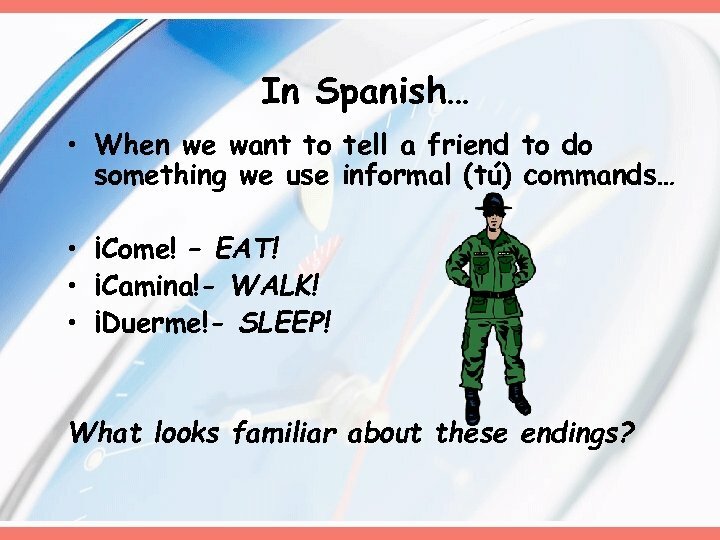 In Spanish… • When we want to tell a friend to do something we use informal (tú) commands… • ¡Come! – EAT! • ¡Camina!- WALK! • ¡Duerme!- SLEEP! What looks familiar about these endings? 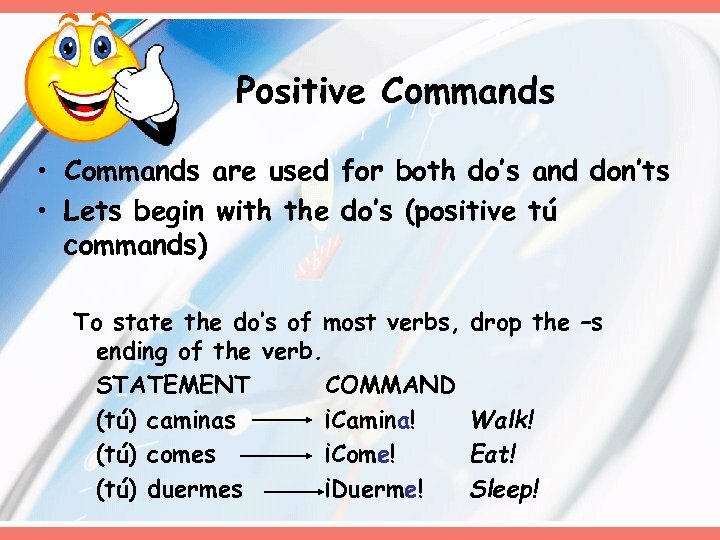 Positive Commands • Commands are used for both do’s and don’ts • Lets begin with the do’s (positive tú commands) To state the do’s of most verbs, ending of the verb. STATEMENT COMMAND (tú) caminas ¡Camina! 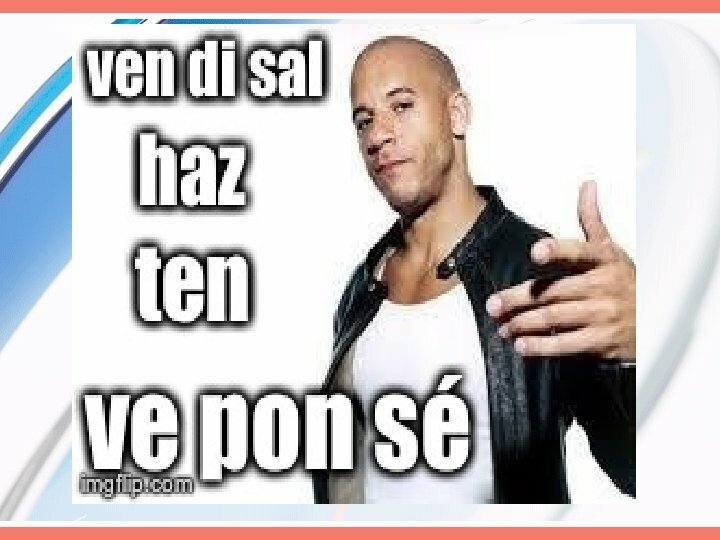 (tú) comes ¡Come! (tú) duermes ¡Duerme! drop the –s Walk! Eat! Sleep! 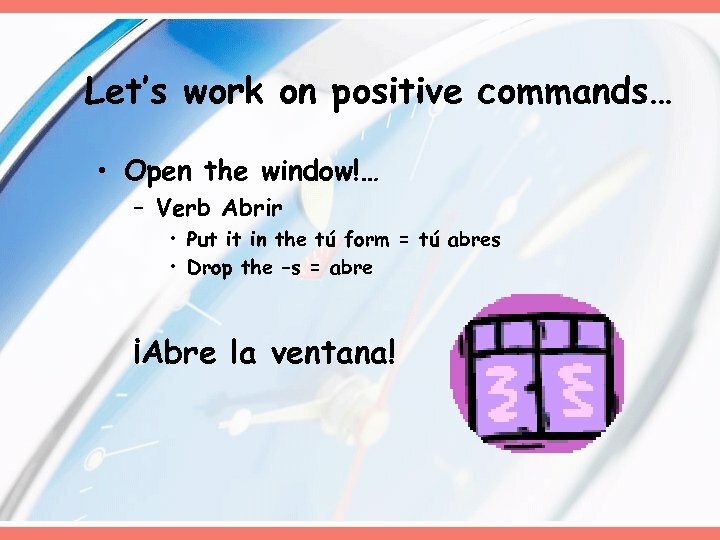 Let’s work on positive commands… • Open the window!… – Verb Abrir • Put it in the tú form = tú abres • Drop the –s = abre ¡Abre la ventana! Let’s work on positive commands… • Speak now!. 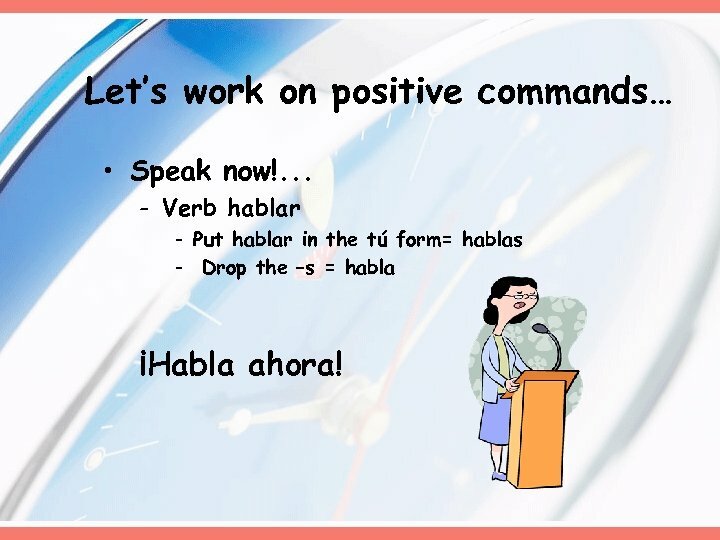 . . - Verb hablar - Put hablar in the tú form= hablas - Drop the –s = habla ¡Habla ahora! Let’s work on positive commands… • Drink water!. 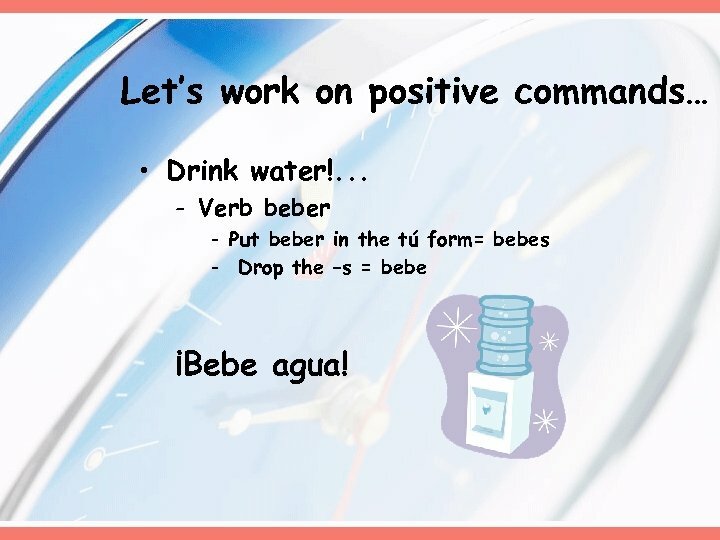 . . - Verb beber - Put beber in the tú form= bebes - Drop the –s = bebe ¡Bebe agua! 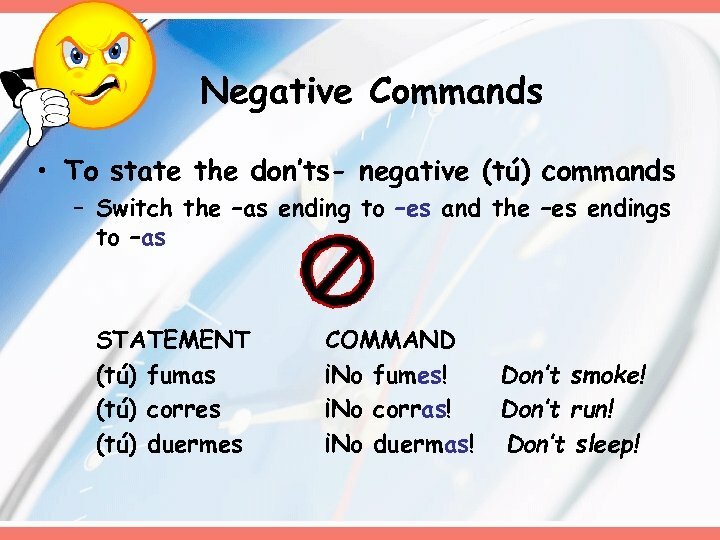 Negative Commands • To state the don’ts- negative (tú) commands – Switch the –as ending to –es and the –es endings to –as STATEMENT (tú) fumas (tú) corres (tú) duermes COMMAND ¡No fumes! ¡No corras! ¡No duermas! Don’t smoke! Don’t run! Don’t sleep! Let’s work on negative commands… • Don’t buy the shoes!. 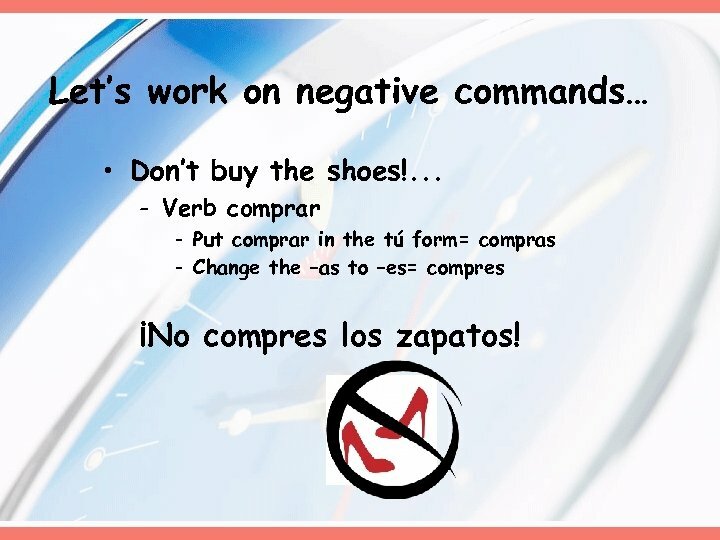 . . - Verb comprar - Put comprar in the tú form= compras - Change the –as to –es= compres ¡No compres los zapatos! Let’s work on negative commands… • Don’t open the door!. 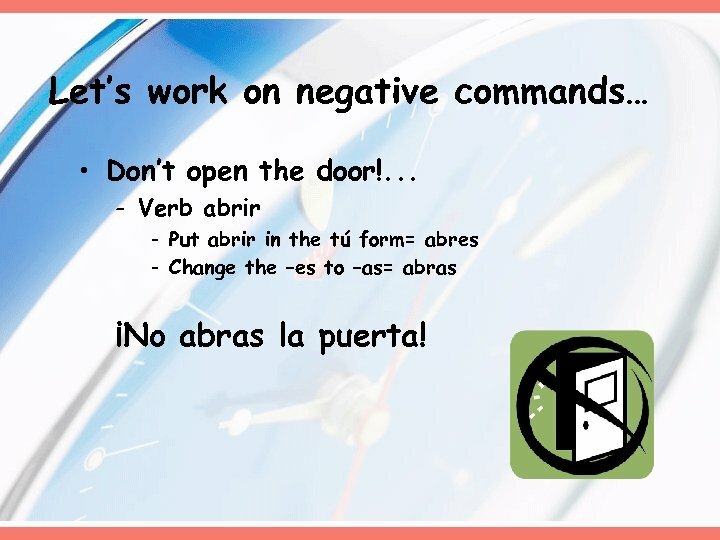 . . - Verb abrir - Put abrir in the tú form= abres - Change the –es to –as= abras ¡No abras la puerta! Let’s work on negative commands… • Don’t drink soda!. 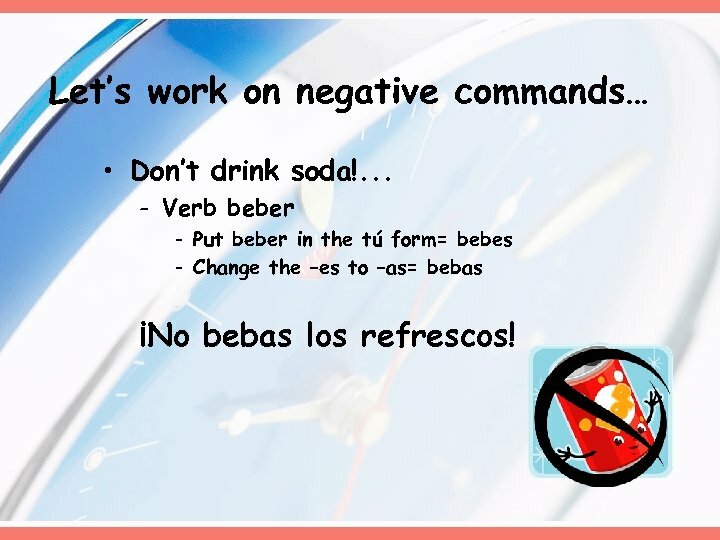 . . - Verb beber - Put beber in the tú form= bebes - Change the –es to –as= bebas ¡No bebas los refrescos! 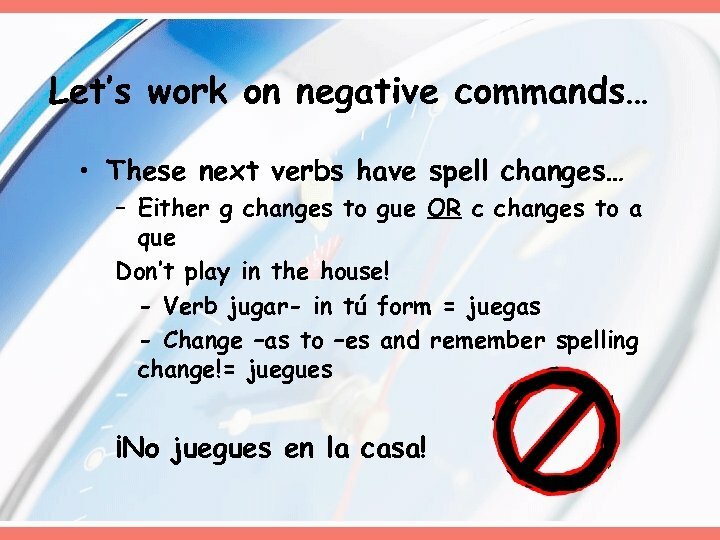 Let’s work on negative commands… • These next verbs have spell changes… – Either g changes to gue OR c changes to a que Don’t play in the house! 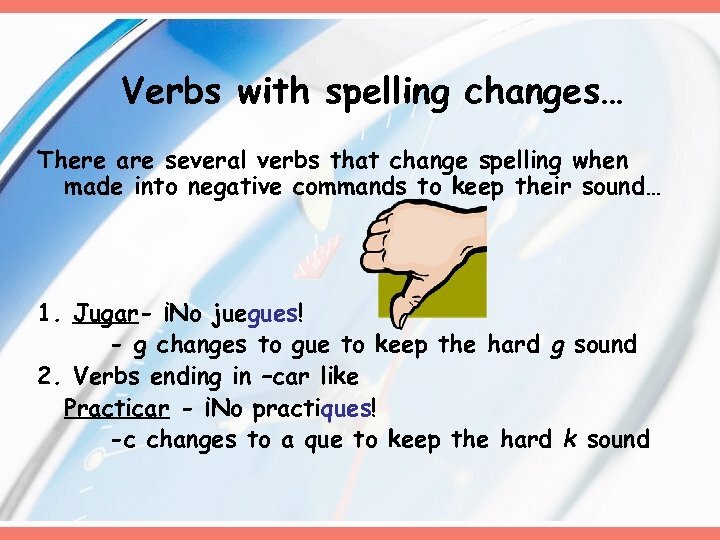 - Verb jugar- in tú form = juegas - Change –as to –es and remember spelling change!= juegues ¡No juegues en la casa! 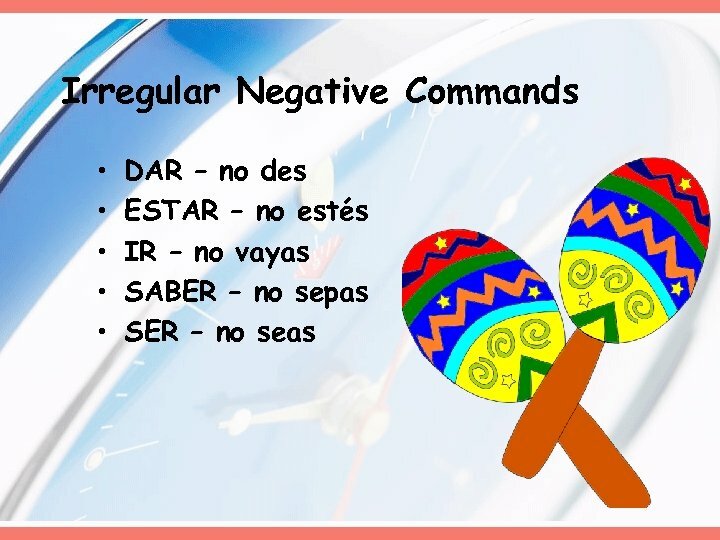 Let’s work on negative commands… Don’t arrive late! ¡No llegues tarde! Don’t touch the piano! 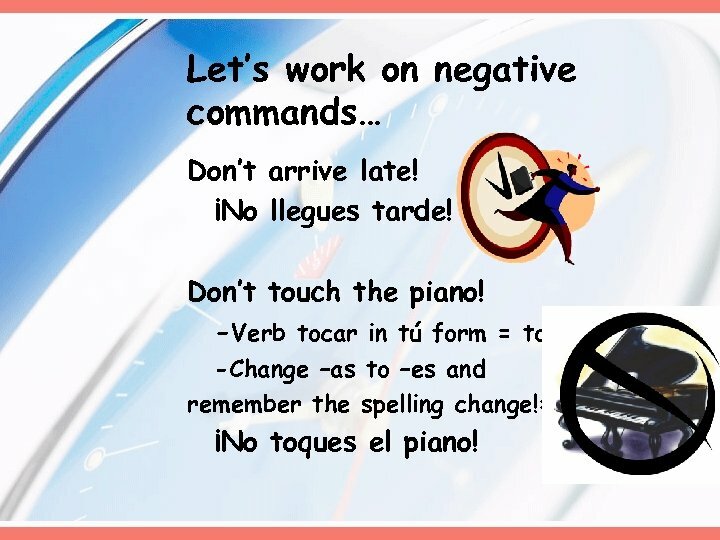 -Verb tocar in tú form = tocas -Change –as to –es and remember the spelling change!= toques ¡No toques el piano! 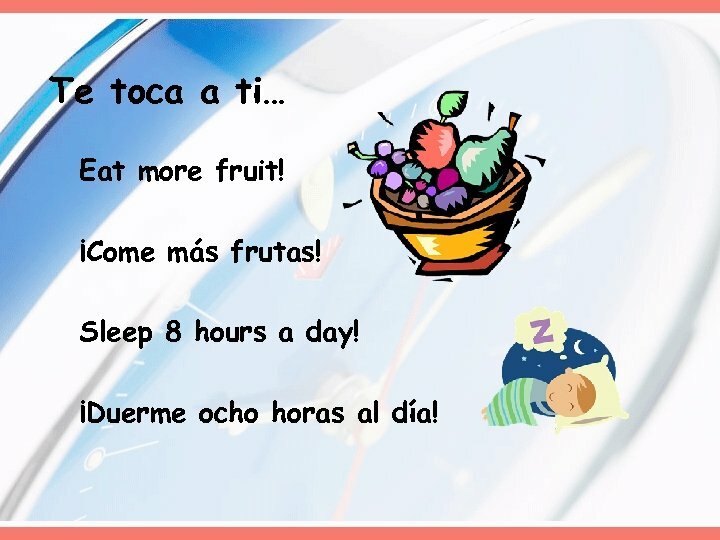 Te toca a ti… Eat more fruit! ¡Come más frutas! Sleep 8 hours a day! ¡Duerme ocho horas al día! 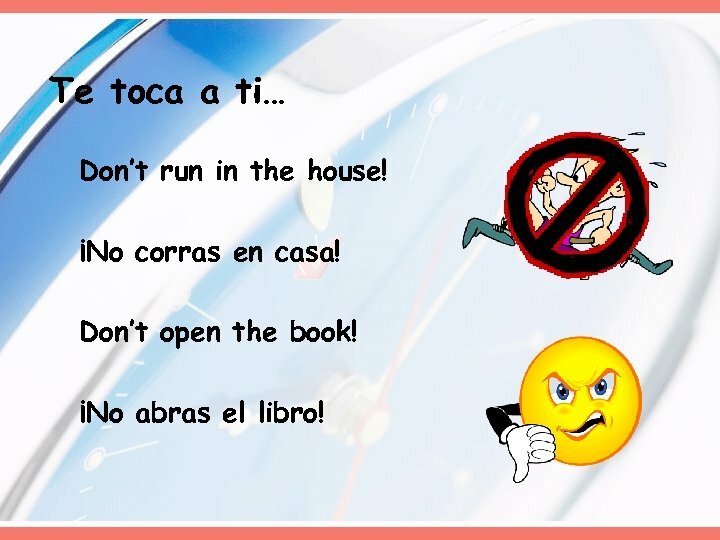 Te toca a ti… Don’t run in the house! ¡No corras en casa! Don’t open the book! ¡No abras el libro!